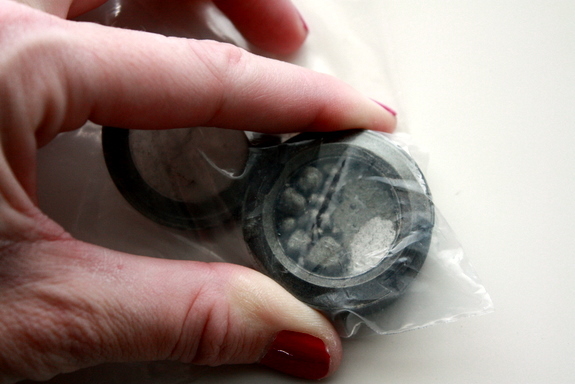 How to repair your shattered eyeshadow. Today I’m going to share something with you, something precious and close to me. It will help you preserve your sanity and hard earned dollars. It might be a little bit of fun for your Monday too, but I don’t want to assume things on your behalf. Have you ever shattered a brand new eyeshadow? I’m here to help with a makeup tip from the pros. Are you here from StumbleUpon? Thanks so much for visiting! If you like what you see, I have plenty more where this came from. Subscribe to get a little Petit Elefant every day. Thanks! So, a little while ago I discovered makeup tutorials on YouTube. I don’t even have time enough in the day to watch all the good stuff out there. There is such a vast pool of makeup information on the internet I don’t even know where to direct you, but YouTube is a great start. There’s a makeup artist for everybody on YouTube, and I’ve found mine. Her name is Kandee Johnson, a professional makeup artist and all around ball of sunshine who’s massively skilled. Last week Kandee taught me a skill that has already saved me about $45. Do you ever break your eyeshadow? Like, drop it on the ground and shatter it? It’s heartbreaking, especially when you’ve forked over serious cash for the good stuff. I’ve thrown away hundreds of dollars in makeup because I’ve shattered it doing heaven knows what. 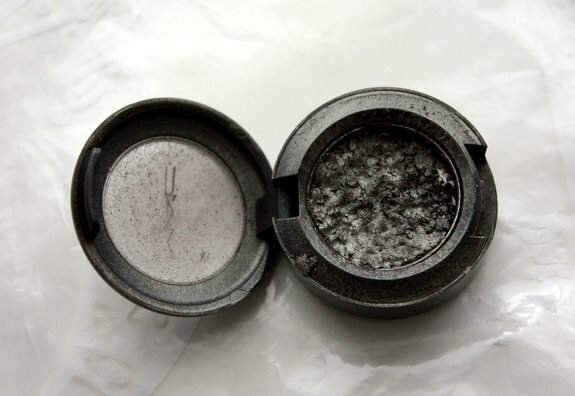 This is what your eyeshadow looks like after you’ve smashed it with a spoon. 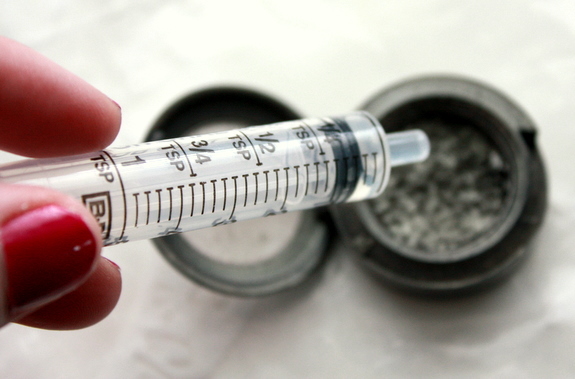 Add rubbing alcohol with a dropper to your smashed eyeshadow. Don’t add too much, just a few drops. 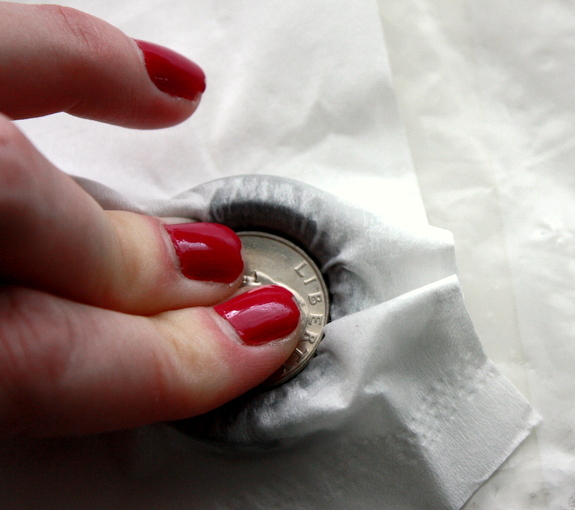 Place a tissue over smashed eye shadow and press down with a quarter after you’ve added some rubbing alcohol. This is what your eyeshadow looks like after you’ve repaired it by smashing it and re-pressing it with rubbing alcohol and a quarter. Step 6: Keep saving money by doing DIY things yourself. Isn’t that awesome? I’ve already done this to three of my favorite shattered M.A.C. eyeshadow compacts. I’m so happy I can’t even tell you. Listen, don’t judge me. It’s the small bits of happiness in life that make it worthwhile. << I was fashionable, even then. I never thought I’d be one to watch people put on makeup, but I DO! I love the makeup community on YouTube. I’ve watched quite a few of Kandee’s videos. She is great. I think Amarixe does the best makeup tutorials. She is fantastic and has great video quality. Oh…and I LOVE this tip. I depot all my mac shadows and keep them in palettes, which makes shattering especially sad because the mess goes everywhere and they get all mixed up. This has made my life 10 kinds of happy. And call me weird, but there’s something soothing about watching someone apply makeup. Genius. THANK YOU for sharing! I can’t tell you how many times I’ve shattered my eyeshadow and sworn because it was brand new or hardly used… what a waste of money! Okay, I have a question for you – what about eyeliner? I use Aveda eyeliner and love it, but if I try to sharpen it, I end up losing half my stick because it breaks or I have to keep sharpening it to get a good point. Is there a better sharpener I should use? Am I totally retro for using pencil? If you wear eyeliner, what kinds do you suggest? I can do a tutorial on eyeliners. Only really cheap eyeliners should be shattering like that so you probably need a new eyeliner sharpener. You’re probably right – time for me to get a new eyeliner. I’ll look forward to your tutorial… and hopefully some recommendations! You’re great! If you put the pencil in the fridge or freezer before you sharpen it, it’s supposed to make it easier and prevent shattering. I’ve never needed to try it, but it’s a fairly common make-up tip. Can’t hurt to give it a shot! When you say to smash the remaining broken bits, my heart screams, “No!” But, it all makes sense. Thanks for posting this, I’m going to repair some makeup right now. My heart and mouth both scream no every time I shatter one. Brilliant!!! I drop them all the time. Would it also work for blush and pressed powder? Totally. It’s just alcohol and it will evaporate completely. I’m a better mom myself, armed with this important knowledge. Wow. I feel suddenly smarter. You’re so awesome. I just shattered one on Saturday and tossed it this morning before reading your blog. BLAH. This tutorial is freaking awesome. I’m so sorry, I completely feel your pain. I’ve thrown away so much makeup. Wow, so smart and awesome! I hate when this happens when I travel (especially if it gets all over my make-up bag) I’m sure I will be using this tip one of these days! Just be sure to take a ziplock bag with you, bring it home, and the rest is history. I know, right? Your kind of tip. This is the best tip I have learned on the internet all year. Blessings on your head! Now if I can figure out how to reconstitute all the ruined lipsticks of my children’s lives…. I like her, a lot. But I think Kandee has the technical knowledge I seek. That is awesome. Thank you so much for sharing!!! I had no idea that there was a whole makeup community on YouTube beyond the haul girls, so I will definitely check it out. Amy, you need to, it’s opened up a whole new world for me. For reals. This has made my day. I am bookmarking this page forever! Happy to hear it Ali! Just found you thru tipjunkie– need that leather avaitor jacket you posted about…where is it from?? Thanks for the make-up tip! Love me some Mac and I can get a littel clutzy in front of the mirror– with brushes and compacts and all! Btw- love the way you write– so funny! The aviator jacket was from Eddie Bauer I think. Thanks for the tutorial! I’ve recently started watching make up tutorials on youtube too! Pixiwoo is the best channel in my opinion! My sister loves Pixiwoo too! This worked well enough but did the rubbing alcohol just bubble on top of the eyeshadow for you? That’s what happened to me so the alcohol was just absorbed into the tissue when i got to the quarter step. It absorbed well enough, but if it’s super cheap eyeshadow maybe it won’t work as well? I’d try again. 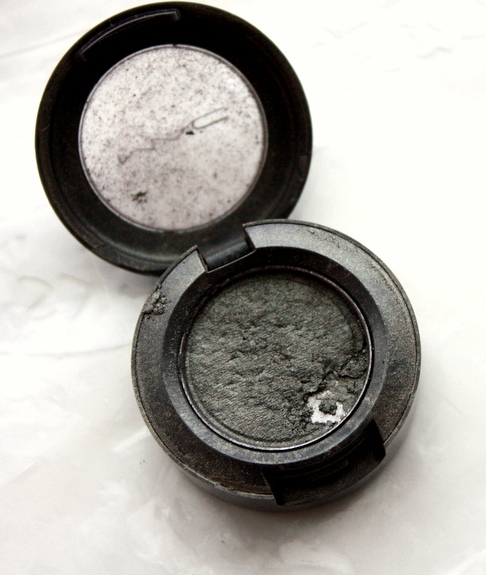 OMG–I have like five MAC shadows that are totally broken right now. I have them all in a bag being sad together–intending to recycle them at MAC. Hey! I just tried this out in two eye shadows, and I’m sooo happy! I was quite sad when they broke, but I couldn’t bring myself to throw them away! And I’m damn glad I didn’t! I shared your site with my girlfriend. She throws away so much makeup. I’m sure she will love this site and your tips like this one about broken eye shadow. Fabulous tip! This has inevitably happened to all of us and this is a great and simple fix. Thanks! Wish I had seen this a week ago! :( Stumbled upon this page, it’s like it was fate, I shatter these stupid things ALL THE TIME. Excellent!! Thank you so much. 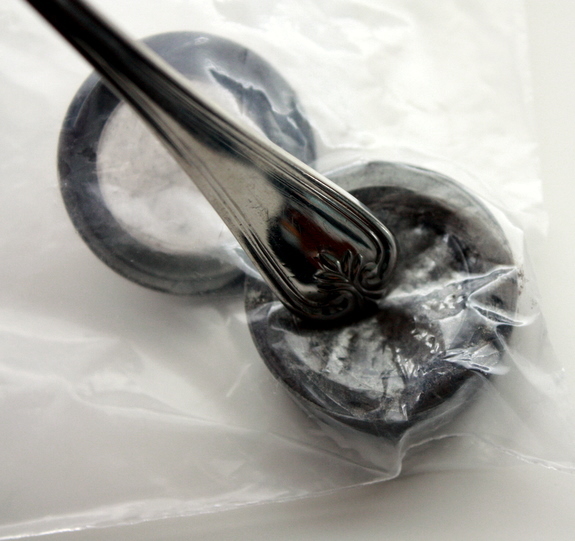 A friend sent me this link and I was blown away by the fact that such a simple procedure can make my MAC eyeshadows brand new again! I’ve got a beautiful green I’ve been very carefully opening to apply– not anymore, baby! Totally grateful for this tip. Thanks! Oh my gosh! I can’t believe I’ve only found your blog now, I threw my mac eye shadow in the bin because it was cracked all over, typical! At least now I know what to do next time, you kinda wonder how people figure these things out! great tutorial. 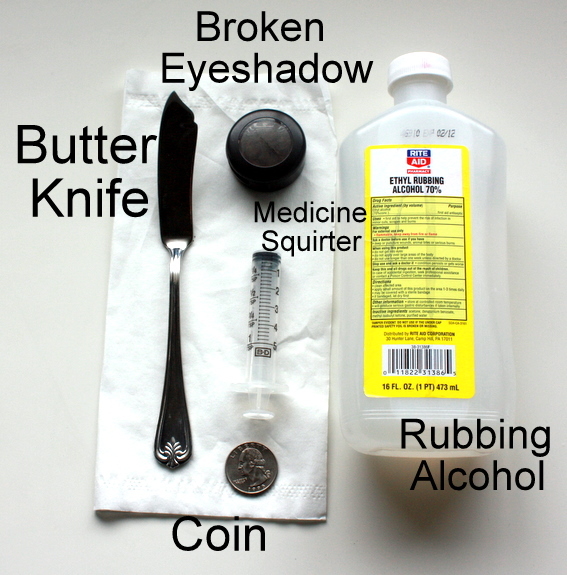 but ummm a “medicine squirter” last i checked is called a syringe…. This is AMAZING. I do this all the time, so I will definitely use this trick! Even with the cheap shadows it’s heartbreaking, because it can be so hard to find the right colors!!!!! THANK YOU! I found your blog through StumbleUpon and landed on your amazing post about pore strips, which I am going to try straightaway. A little more reading brought me to this sanity-saver. I came home last night with a new (cheap) eyeshadow and immediately dropped it. It didn’t shatter, but I shudder to think how many have. Problem solved!